Get excited! 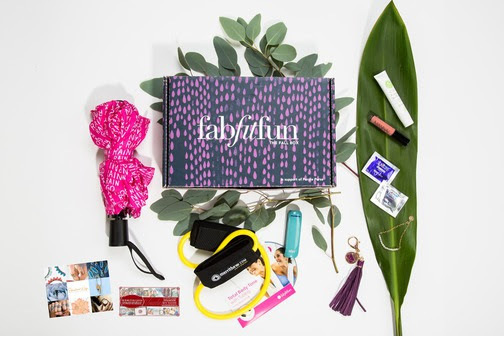 It's time for the Fall 2015 FabFitFun Box! Every 3 months, FabFitFun VIP members receive a new box filled with the most fab items, handpicked by Guiliana and the FabFitFun team. The quarterly subscription is $49.99 and filled with the hottest items of the season in beauty, fashion, fitness, and wellness. The Fall Box is almost sold out so GET IT NOW if you want to check out this awesome box. Code FAB10 will take $10 off your box! The purple box for Fall 2015 is in partnership with Allstate Foundation Purple Purse to help spread awareness about Domestic Violence for the month of October. What I love about FabFitFun is that they pack their boxes FULL with mostly full size items in various categories. They really hit on all of your interests and not just one genre. Starting off with my absolute favorite item in the box! How quirky and fun is this umbrealla? 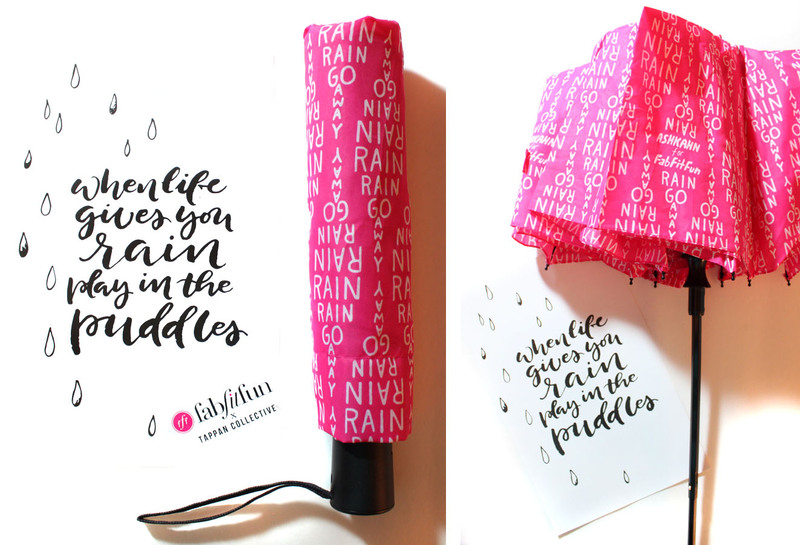 It is imprinted with "Rain Rain Go Away" in a bright cheery hot pink. This will come in handy for like the next 9 months here in the Pacific Northwest. Subscribers are given the choice between colors Pink, Sky Blue, Yellow, Mango, and Black. It was designed by LA-based artist Ashkahn Shahparnia exclusively for FabFitFun subscribers. Not only do you get this incredibly luxurious mask..but you get TWO OF THEM. I can never have too many face masks and the crazier the mask looks on the better. Gold Radiance Luxury Facial Mask looks like you dunked your face in pure gold. This Collagen mask is infused with colloidal gold and damascene rose. 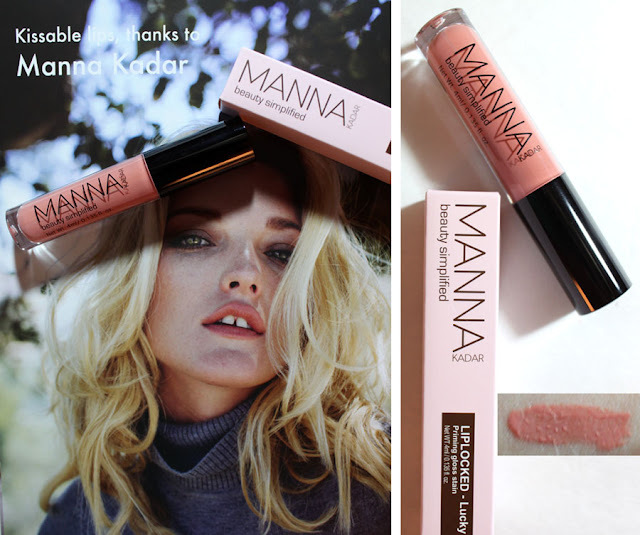 One of my most loved blushes this Summer was MANNA Unsung, the most gorgeous matte coral. Lucky Liplocked is that blush in lip gloss form. Just a beautiful shade of coral in a shiny non-sticky gloss. I really need to check out this brand more! I have been super impressed with the quality and pigmentation of their makeup. 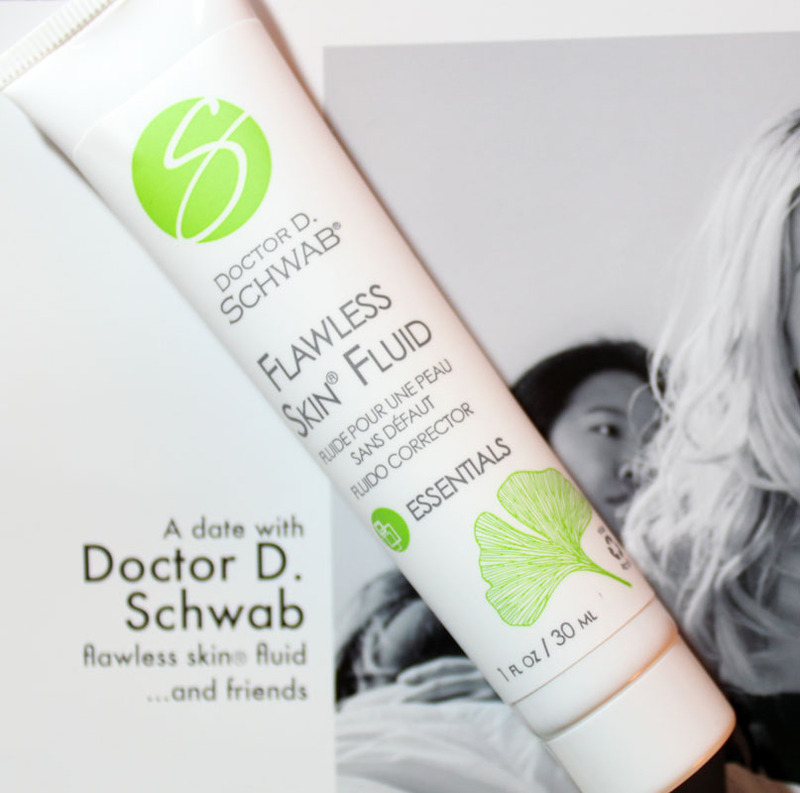 I hadn't heard of Dr. Schwab before but by the name Skin Fluid I thought this would be another serum. It is in fact a tinted moisturizer/primer. The tint is light with just a touch of shimmer to brighten up the complexion and even out the skin. I really enjoyed this! As a fan of light coverage foundations I can see myself using this daily and its all natural. Subscribers will get their choice of one of three colors and mine was Green. Never can have too many portable power banks. I keep these in my car, purse, for travel they always come in handy. 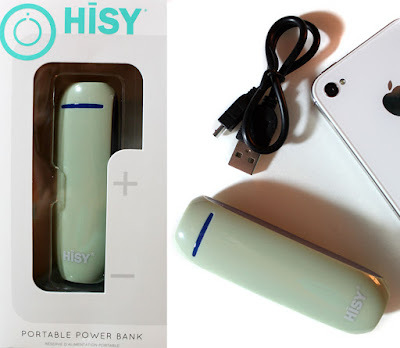 HISY is the right size and weight for stashing in your purse. 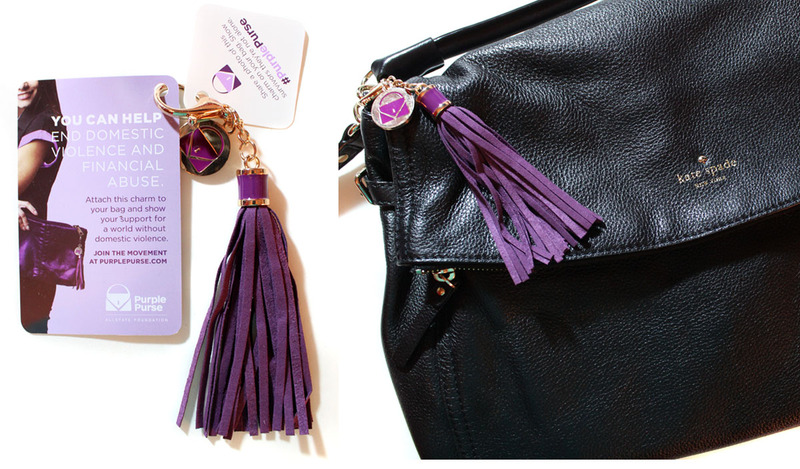 In honor of Domestic Violence Awareness Month FabFitFun teamed up with Allstate Foundation Purple Purse to spread awareness about Domestic Violence. By wearing this charm you are letting those know they are not alone in their fight. Not only is it a beautiful message of support but the charm is gorgeous. I love how it gives a pop of color to my basic black handbag for Fall. 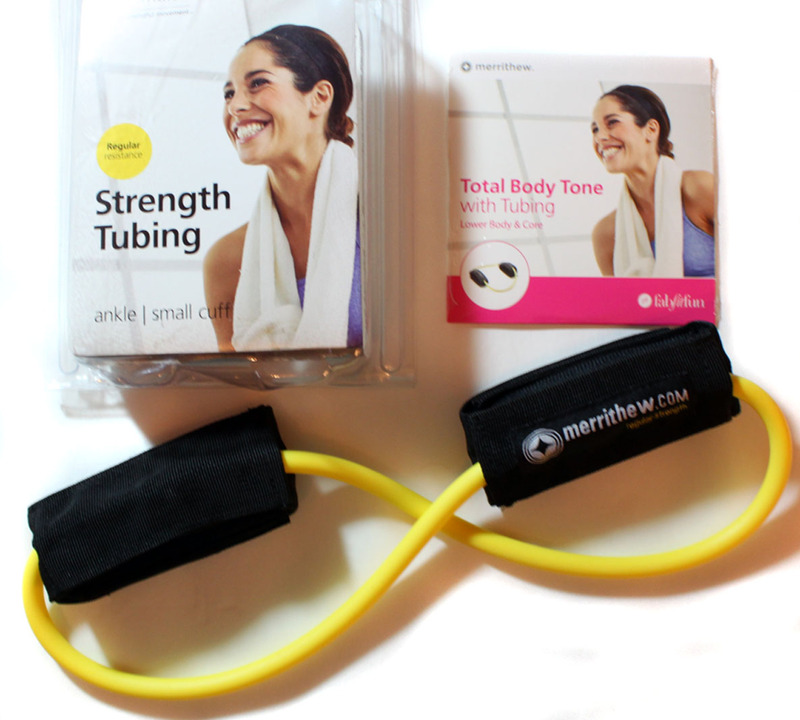 The 'Fit" in the box is a Total Body Tone dvd workout and Tubing resistance band. After hurting my shoulder pretty badly a couple months a go this is going to be great because it focuses on the lower body and core. At home DVD workouts are an addiction of mine and I'm happy to have another one to add to the collection. For the Tribe Alive Bracelet VIP Members have a choice of Mexican Blue, Grey, Aquamarine, or White Jade. I received the Mexican Blue which is what I would have chosen myself. My jewelry aesthetic has turned towards delicate pieces lately with gemstones and these tiny crystals fit right in. Definitely check this brand out if you haven't already. Tribe Alive utilizes a passion for fashion and responsible commerce as a platform to help alleviate poverty among women. Jeweler's Wife carries a nice selection of designer brands like Michael Kors, Sequin, Kendra Scott, and House of Harlow. The $15 off will come in handy to knock down the price on some of the more expensive pieces. I'm deciding to spend mine between the Tanga Coast Gunmetal Pendany from House of Harlow 1960 and TOUS Black Spinel and Ruby Heart Necklace. This includes free shipping which is awesome! Picture It on Canvas $75 Gift Card Picture It On Canvas lets you make all kinds of customized printed items. Everything from prints to coasters. This one also includes free shipping. This girl is all about the Colgate Optic White but I will never turn down trying anything that whitens and brightens the smile. Looking forward to trying this out! FabFitFun put together one awesome box this Fall! Every item in here is something I know I will use. No filler or weird stuff and the gift cards are actual ones not just coupon codes. The Fall box would be great to buy multiples of and split up for Holiday Gifts too. The total value came to around $350 and was well worth the $49.99 subscription price. Don't forget you can get $10 off your first box, which would be this box if it hasn't sold out! They still have some left so get them before they are gone! Use Code FAB10 at checkout!